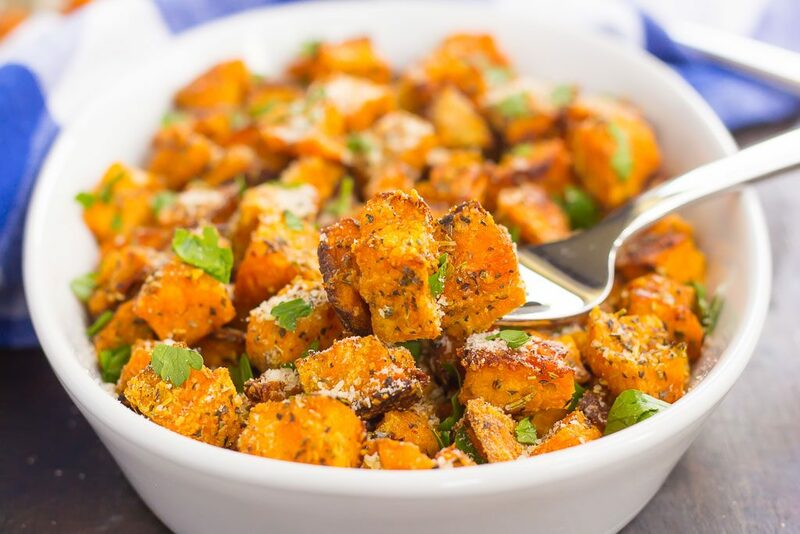 These Roasted Parmesan Herb Sweet Potatoes are seasoned with a blend of Parmesan cheese, garlic, and herbs. 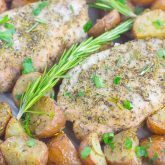 Roasted until crispy on the outside and soft on the inside, this easy side dish is full of flavor and perfect for just about any meal! Fall is upon us, so I feel it’s safe to officially crack open the sweet potato recipes. I realize that sweet potatoes aren’t really just for fall, but, I kind of consider them a “cooler weather” food, at least when I’m making them. You may remember these Roasted Maple Cinnamon Sweet Potatoes from last fall…it’s one of my most popular recipes! And since then, I’ve been hooked on roasted sweet potatoes. And by roasted, I mean “loaded with flavor” sweet potatoes. I’ve never really liked sweet potatoes growing up, unless it was smothered in brown sugar, cinnamon, and butter. Definitely not the healthiest, but oh-so good! But, other than that, I wouldn’t touch sweet potatoes with a ten foot pole. But, since my tastes have definitely evolved over the years (thank goodness, right? ), I decided to give sweet potatoes another shot. And when I made those maple cinnamon sweet potatoes, I was hooked. I still have a hard time eating them plain, but pile on the seasonings, and I’m one happy girl. And these potatoes are just about as easy as you can get. The hardest part is slicing and dicing, which doesn’t take long. And the seasoning. Wow. It’s just so zesty and full of flavor. 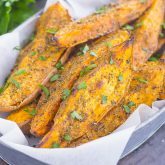 A blend of olive oil, Parmesan cheese, garlic powder, and Italian seasoning coats these savory Roasted Sweet Potatoes. And once they’re coated, it’s time for the oven to work its magic. And that’s it! Once these crispy roasted sweet potatoes are done roasting, sprinkle on just a little more Parmesan cheese for the finishing touch. I mean, you can never have too much cheese…am I right? So if you’re looking for that perfect, oven roasted sweet potato recipe, look no further. I guarantee you’ll love the crispy texture, seasoning, and cozy fall flavors of these Roasted Parmesan Herb Sweet Potatoes! In a medium bowl, combine the olive oil, Parmesan cheese, Italian seasoning, garlic powder, salt and pepper. Add diced potatoes and toss to coat. Spread potatoes in an even layer onto prepared pan. Sprinkle with extra Parmesan cheese and parsley, if desired. Just...yum. Perfect autumn side dish, right there. I love sweet potatoes with parm! It's such a good combo. Super addictive! There's NO such thing as too much Parmesan when it comes to potatoes! I LOVE that you used sweet potatoes rather than the regular potatoes you usually see in dishes like this! This would go SO good alongside a fall roast chicken!! Yay for sweet potatoes! I could (and do) eat them year round, but, like you, consider them more of a cooler weather food. This is a perfect side dish and I bet it would also be perfect around the holidays. Yes, I'm already thinking about that, lol :D I totally agree, can never have too much cheese. Never ;) Pinned, of course. Have a wonderful week! Thanks, Dawn! I agree, this would be perfect for Thanksgiving or Christmas! Gayle, I am seriously so excited for fall!!! I can't wait! and I love these herb roasted sweet potatoes!!! oh my gawd, they look SO good! and what a great idea! LOVE! Thanks for the sweet potato love, Alice! Sounds like you and I are twins! I used to hate sweet potatoes, too! Thanks for the kind words, friend! Sweet potatoes are a staple in my house year round, and this is a recipe I need to try! This dish is just gorgeous Gayle and I love these flavors. Those potatoes are so perfectly crispy I just want to dive into that bowl! Thank you, Marcie! I'm hooked on roasted sweet potatoes! This is my favourite time of the year, so I am super excited. 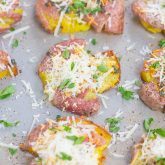 These sweet potatoes look perfectly cooked and I am loving the herbs and parmesan on them. YUM! Thanks for the kind words, Dannii! I'm with you in that I feel like sweet potatoes are definitely fall food. After all, how often do people eat sweet potato pie when it isn't fall? I love your side dish here. Looks so loaded full of flavors and would be perfect on Thanksgiving! This will be a very popular side dish in our house this fall! We love sweet potatoes!! This looks like the perfect side dish, Gayle! I love sweet potatoes all year long but even more so once the cooler weather arrives! And roasting them with parmesan and all those yummy herbs? Yum, I want this entire pan for lunch! 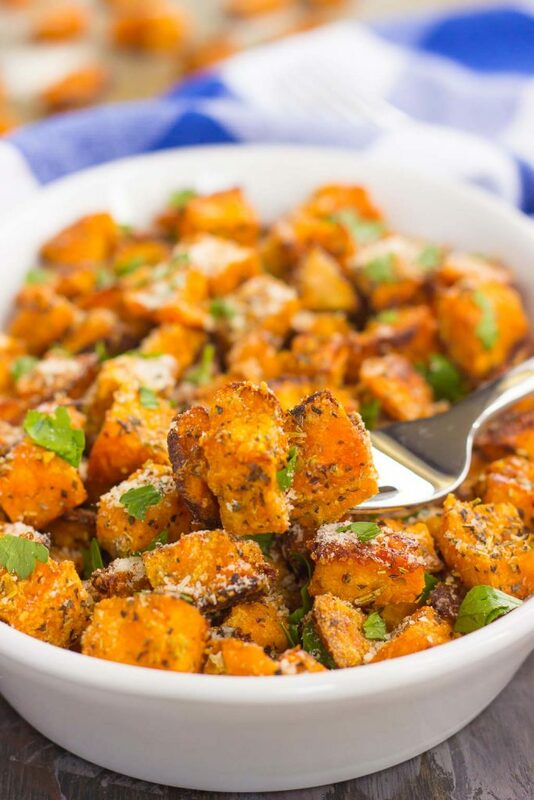 Love the savory seasonings on the sweet potatoes! I'm a fan of anything that has a salty-sweet combo, so I know these potatoes would be a perfect side dish for the season. YUM! Roasted sweet potatoes are the best! Love the parmesan herb combo! Thanks for the sweet potato love, Jessica! Savory sweet potato dishes are my favorite! These look so good! These sound really delicious! I adore sweet potatoes! I really need to make more sweet potatoes! I've only made them a couple times (okay, I was scared!) but we liked them! I need to experiment a little more with them -- cheese and herbs sounds like a good place to start! I've never loved sweet potatoes either, but enjoy them occasionally now and these ones look amazing. Pretty sure I would love these! I was the same way! Sweet potatoes were the thing I skipped at Thanksgiving (unless gooey marshmallows were involved). Now, though, I love them! 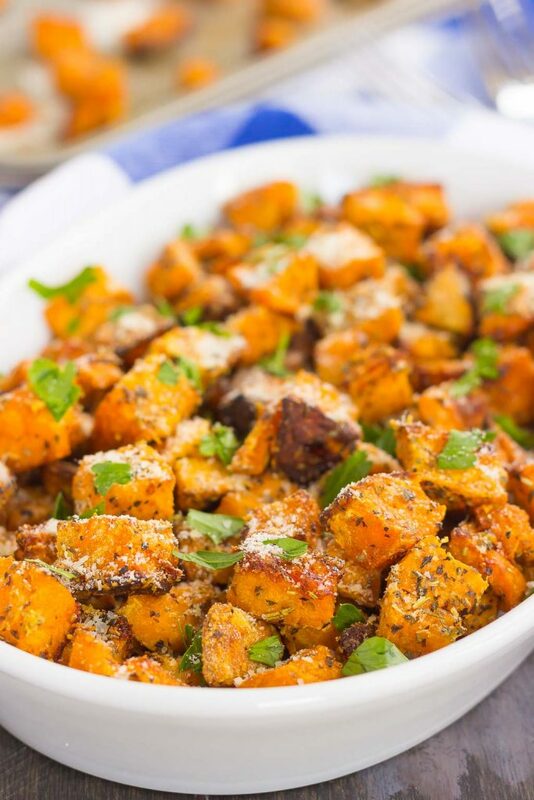 The flavors of parmesan and herb sound amazing with sweet potatoes! 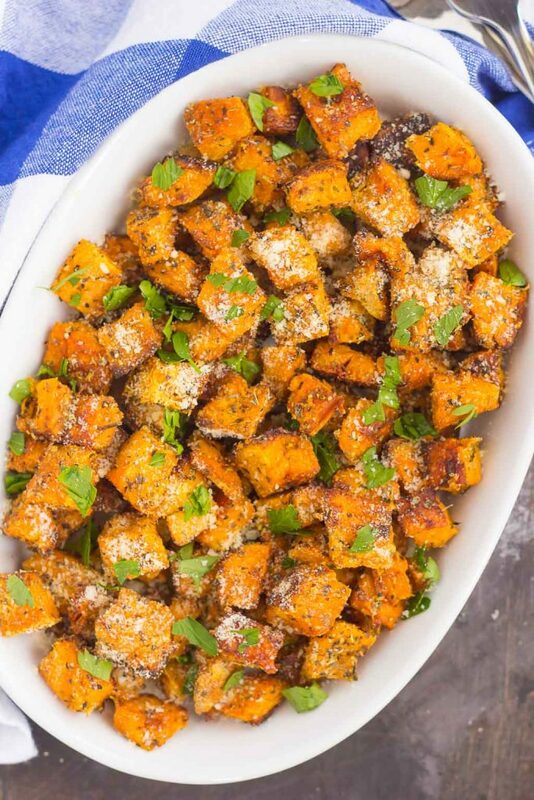 Love sweet potatoes and the addition of parmesan is perfect! Pinning! Thanks for the sweet potato love and pin, Mira! I could eat sweet potatoes every day! I usually make them with brown sugar and cinnamon but I'm totally digging this savory version. I can't wait to try it!! Brown sugar and cinnamon are my other favorite kind, but this definitely hits the spot too! I always think of sweet potatoes as a cool weather food, too! And this is the perfect delicious preparation - they look amazing! Loving that crunchy parmesan coating. Definitely making these with dinner soon. I always gravitate towards sweet potatoes in the fall, too! I love this combo you have going here, Gayle. 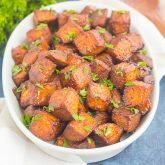 I love savory preparations for sweet potatoes, so this is definitely going on my must-try list! I could eat sweet potatoes every day! Love learning new recipes with sweet potatoes! Yummy! Thanks for the kind words and for stopping by, Agness! I was looking for a savory sweet potato recipe for our Thanksgiving celebration, and this was perfect. No leftover, and everyone asking for the recipe! There is no finer compliment. Thank you for sharing! I'm so glad you liked this, Kathy! Thank you so much for stopping by and letting me know. This makes my day! :) Enjoy your weekend! I altered this recipe a bit to become baked sweet potato cakes by cooking the sweet potatos first then blending them with the spices, 1/3 cup white cheddar and the rest parmesan. Then added some grated and drained onion. I used the onion juice with cooked spinach and some greek yogurt to make a dipping sauce. I made the potato mixture into balls and slightly flattened them on a big sheet and baked, flipped when bottoms got brown. It was really great, thank you for the base recipe! Sounds like you made some delicious additions! Thanks for sharing, Madeline! So glad you enjoyed these! I just served a double batch of Roasted Parmesan Herb Sweet Potatoes to a group of seniors on this Memorial Day 2018 potluck. It was such a hit I was called out to find out who had prepared the dish...the only one to be called out by the way. Several ladies asked the "man" who made it for the recipe. I added just a touch of ground nutmeg. I'm so glad everyone enjoyed this, Lucky! Your touch of ground nutmeg sounds delicious. Thanks so much for stopping by and letting me know how it turned out! Super easy recipe for breakfast, I love simple breakfast! Glad you enjoyed these, Stacey! This was very good, but I felt it was in desperate need of salt, which I normally don’t use with sweet potatoes when cooking with coconut oil. I made the exact recipe except did not have the fresh parsley to add at the end. I also broiled them at the end for a total of 8 min stirring after 4. Thanks for the easy and tasty recipe! I'm so glad you liked these, Meggo! Thanks so much for stopping by and letting me know how they turned out! I'm so happy to hear that, Maria! Thanks so much for stopping by and letting me know how they turned out! I was googling a recipe for sweet potatoes tonight and came across this one. OMG!! My husband and I absolutely love it!! Will definitely be making it again in the future!! Thank you!! I'm so glad you loved these! Thanks so much for stopping by and letting me know how they turned out for you! Thanks for posting this delicious recipe. My only problem is that they are so good, I’m going to have a hard time keeping my fork out of them before Thanksgiving tomorrow! Yum! Hi Jodi! I'm SO glad you liked these. Very addicting, right? :) I made these for tomorrow, too! Thanks so much for stopping by and letting me know how they turned out. Happy Thanksgiving! Hi Neha! I haven't done that before, so the potatoes might lose some of their crispiness if you reheat them. Just a guess, though, as I usually make and serve right away. Enjoy! I finally got to make these roasted parmesan herb sweet potatoes this past weekend, and it was such a hit!! I found your post from Pinterest! I'm also going to pin this post on my Pinterest board my followers will love it. Thanks for sharing Gayle! I'm so glad you loved these, Kara! Thanks so much for stopping by and letting me know how they turned out! I'm so happy to hear that, Issac! Thanks so much for letting me know how they turned out! Gayle, this looks tasty! These are absolutely mouth watering! It will quickly disappear in our house, very tasty and flavorful! Thanks for the kind words, Olga!